But when the goodness and loving kindness of God our Savior appeared, 5 he saved us, not because of works done by us in righteousness, but according to his own mercy, by the washing of regeneration and renewal of the Holy Spirit, 6 whom he poured out on us richly through Jesus Christ our Savior, 7 so that being justified by his grace we might become heirs according to the hope of eternal life. 8 The saying is trustworthy, and I want you to insist on these things, so that those who have believed in God may be careful to devote themselves to good works. These things are excellent and profitable for people. 9 But avoid foolish controversies, genealogies, dissensions, and quarrels about the law, for they are unprofitable and worthless. 10 As for a person who stirs up division, after warning him once and then twice, have nothing more to do with him, 11 knowing that such a person is warped and sinful; he is self-condemned. We're friends here, but I'm a bit uncertain as to why you posted what you posted. First, thanks for sharing Titus 3, but even these wonderful words of Scripture demonstrate how difficult the intentions of communication can be. For instance, I wondered if you posted the passage because of the phrase "washing of regeneration" as a proof for the Lutheran understanding of baptism proper. In other words, if I don't see this verse as a text clearly implying baptism (as understood by the Lutherans), then well, the Lutherans believe the Bible and I do not. Then I wondered if you posted the passage because you think my blog entry is an example of a "foolish controversy" which is "unprofitable and worthless." Then I wondered if you posted this passage to warn me once (or twice) that I'm stirring up division. Then I wondered if you cited this passage to ultimately inform me I was warped, sinful, and self-condemned. Then I considered the possibility that it was all these things combined. Then I considered the possibility I had no idea why you posted the passage. As to the blog entry you provided, that also didn't make sense to me as to how or why it was a response to what I posted. Why a person who was a Protestant and Calvinist and then left to join the Eastern orthodox church has any bearing on the point of the blog post is unclear to me. 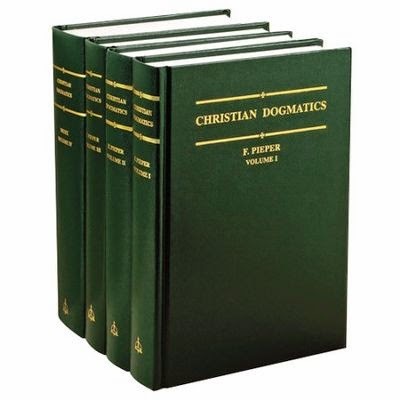 To be fair to Pieper one has to understand that he uses what he regards as Reformed rationalism as a foil to offset the fidelity to scripture of Lutheran doctrine all through his dogmatics. 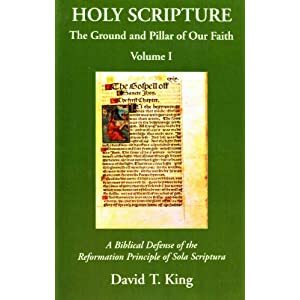 So, it's not a case of resorting to a simplistic "we believe the Bible and you do not"; that criticism is set within a larger narrative of philosophical differences between Lutheran and Reformed theology which more recent scholarship would support. Pieper may not be the most sophisticated exponent of this narrative, and I wish he'd engaged in more exegesis in his dogmatics (the exegetical material was assumed to be covered in other classes), but he was writing for a particular audience - students in a confessional Lutheran seminary - with no inkling that his dogmatics would be read in other settings in English almost 100 years after its inception. Always enjoy your blogging, James. I don't know James. It is just scripture. Does it not fit at all? The link. I have not read all of it, but what I read made me think. If you want to talk it out, we can do it, in a couple of days. Since I've never read Pieper, I'll take your word on what your saying in regards to the historical context. I've come across a number of people in cyberspace, many of which have been Lutheran- that do present the "We Believe the Bible and You Do Not" argument, especially if it's discovered I faithfully attend a Reformed church. Brigitte said...I don't know James. It is just scripture. Does it not fit at all? I simply asked you for clarification as to which part of the passage you intend me to focus on- or if it's the entirety of the passage, I'm not getting exactly how it serves as a response to what I've posted. I have some sympathy for what you say here. It *seems* reasonable. But let's consider this issue in the wider context of American Protestantism. How does what you are saying here not fall right into Brian McClaren's hands? If we should approach things the way you are saying we should, what argument do you have against his interpretation of the Bible? Interesting article Nathan. Luther nails is as per usual: the Holy Spirit is no skeptic. Nathan Rinne said...James, I have some sympathy for what you say here. It *seems* reasonable. But..."
Here are some random thoughts on what you've raised (well done, by the way- especially your blog post). Let me say upfront that I'm grateful to come across a Lutheran like yourself online engaging in epistemology. The normal strand of Lutheran interacting with me tends to fall into the "We believe the Bible and you do not" camp. "Epistomology? Why that's just human reason." "In hermeneutical and theological disputes, we need to make an exegetical case, and we need to examine the case of those who disagree with us. It proves nothing to make the bare assertion:'We believe the Bible and you don’t.'" When Luther disputed in his polemical writings, sure he sometimes arrived at simply quoting Scripture. He Quoted Scripture, and then shook the dust from his feet. On the other hand, he did make an exegetical case for his beliefs. There's more I could flesh out here, but time escapes me. Now, shame on me, I don't know who Brian McClaren is. My basic response, without knowing anything about him, is a fundamental disagreement with the paradigm that there isn't one right way of interpreting scripture. In fact, if that's what he holds, what he's saying is contradictory, because ultimately he's saying the one right way to understand the Scripture is knowing ultimately there isn't one right way of interpreting scripture. Phooey on that. He's making an ultimate truth claim about ultimate truth claims. I am liking to this article again this morning in a post I just put up (a re-published post of that one I mentioned here before). Its now titled: "Are Confessional Lutherans Just Too Sure of Themselves?" My apologies: I actually do not recall writing this post or the interaction. I've written a lot of posts over the years. It's often the case I'll go looking for the context of a Luther quote, only to find I actually had an entire blog post on it already. As I skimmed over your recent entry, I still don't know who Brian Mclaren is! Some of my interactions with Lutherans that leave me wishing I had never interacted with some of those Lutherans is when they simply assume that their plain citation of a Biblical passage (and their poured in meaning) is simply believing what the Bible says- this at the expense of exegetical argumentation. Currently I'm interacting with a full-fledged schwärmerei (with the Holy Spirit's feathers still sticking out of his mouth). I find it ironic that there's little difference between this schwärmerei and some of those Lutherans I've interacted with... on an epistemological level. Since this person refuses to engage in any sort of cogent exegesis, I've begun simply quoting Scripture passages back to him, in the hope that if this person really does have faith in Christ alone, the Holy Spirit will lead him to think deeply on what the Biblical text says. You know what the result is? The full-fledged schwärmerei becomes even more enraged. When I love something- whether it's my wife, my Jeep Wrangler, or the album Close to the Edge by Yes, get me on any one of those subjects and I'll give you detailed explanations as to why I love them, and I'll enjoy giving those explanations. I don't simply say, "You don't know how to love because you don't know my wife," or, "If you really believed you were driving a good car, you'd own a Wrangler," or, "All music is stupid compared to Close to the Edge." The heart knows and loves what the heart knows and loves, and it typically won't shut up about what it loves. I agree with you and Luther that the Holy Spirit is not a skeptic. On the other hand, I'm skeptical of those who think their interpretation is infallible and certain and ignore exegesis. 1) I would amend one thing in an old comment above I stated, "...ultimately in my heart I'm thinking, 'I believe the Bible, and you do not.'" I would scratch that statement and say that I think people can genuinely believe the Bible incorrectly. The question then becomes: does a person believing the Bible incorrectly in actuality believing in what the Bible says? 2) I note your "amazement: over the post from Steve Hays and also the comment in another link, "serious Calvinists (i.e. vs Arminianism) who do not think it is a big deal whether or not Christians know they have eternal life and peace with God." I find this to be a dreadful misunderstanding of Hays and his typical methodology. Hays is demonstrating faulty Lutheran argumentation. He's pulling down an argument, not making a positive presentation. This is one his main strengths as a writer, and I'm grateful to never have been at the end of his sword. "If a Calvinist is saved, he knows that he’s saved the same way other saved Christians know that they are saved." "You can only “look to Jesus” through the eye of faith. Trusting in Jesus is an act of faith." "We’re not saved apart from saving faith. Our salvation is contingent on faith in Christ. Salvation has subjective necessary conditions as well as objective necessary conditions. And that’s not a problem in Calvinism, for God controls the subjective conditions as well as the objective conditions." The question then becomes: does a person believing the Bible incorrectly in actuality believe in what the Bible actually says? I agree we will be happy to explain that which we love. This is why I am happy that Pastor Cooper, who I mention in the re-vamped post, has the book out now about Reformed vs. Lutheran theology (Cooper is a convert from the Reformed world to Lutheranism). Regarding Hays, I'd have to go back and look at that, but, in any case, I'd say it seems quite clear to me that there is a difference between any view of Christian certainty that the Reformed might have and that which Lutherans can have. Did you get my comment James? Evidently, I submitted it while not signed in, i.e. anonymously. I've been Reformed for many years, and I don't have any personal problems with certainty in God's word, and I don't recall ever seeking to have some sort of of cosmic wiggle telling me I'm OK with God either. Thanks for the note again. As you know, Lutherans say that we can have certainty not because of anything we detect in ourselves (whatever a "cosmic wiggle" is!) but because of trusting the external word. I get that not everyone has struggles like Luther did about where he stood with God. I don't think that kind of angst is necessary for someone to be a real Christian. This is why I am happy that Pastor Cooper, who I mention in the re-vamped post, has the book out now about Reformed vs. Lutheran theology (Cooper is a convert from the Reformed world to Lutheranism). If he sends me a copy, I'll review it. Brian McLaren is probably the main founder/articulator of the Emerging / Emergent church movement. Dr. White actually debated him one time on Unbelievable Radio. As usual, Dr. White did an excellent job. If you'd like to review Pastor Cooper's book, you can get a review copy from James Wipf and Stock. I'm sure he'd love to have your thoughts about it, given your affinity with Luther.